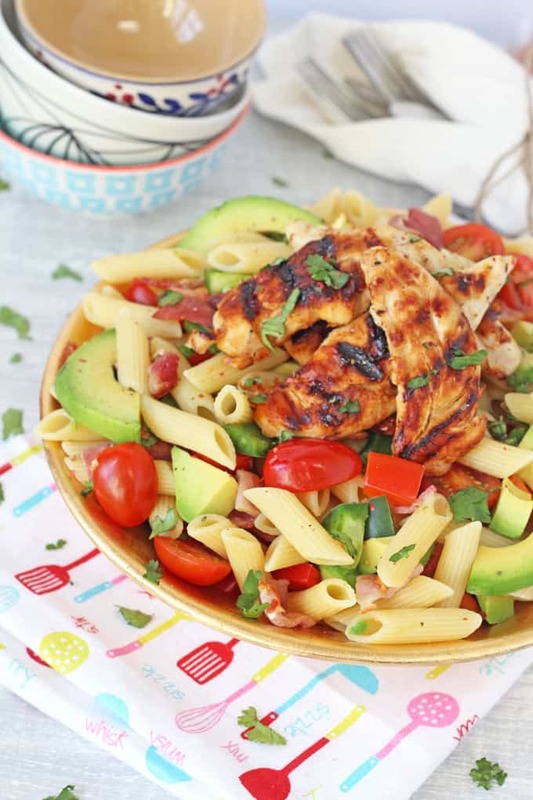 A delicious and simple pasta salad recipe, packed with avocado, bacon, tomatoes and peppers and topped with char-grilled honey mustard chicken fillets. Perfect for summer! Following a pretty chilly start to Spring, the weather really hotted up here in the UK last week and I have to admit I was caught a bit by surprise. 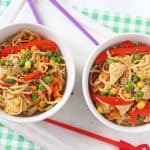 The kids had no summery clothes to wear and I found myself racking my brain trying to think of meals that were a bit more suited to the warmer weather. 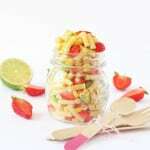 Pasta salad has always been a summer staple of mine. I usually whip it up as an accompaniment to a bbq but this year I decided to jazz it up a little and instead make it the main event for an easy summer’s meal. What I love about his dish is that it is perfect for the whole family for a mid-week dinner. My kids eat early, usually between 5 and 5.30pm but my husband doesn’t eat until 7pm. I loathe having to cook separate meals so my choice of what to make is usually based on what I know will keep and can be reheated easily for him later that evening. 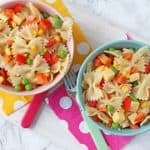 This pasta salad is great for me as I serve it cold anyway so I just cover it with cling film and it’s good to go when my husband gets in from work. The chicken can be reheated but it tastes just as good cold too. There is a small amount of preparation required for this dish in that the chicken needs to be marinated for at least 30 minutes. If you are organised you could always marinate it in the morning and keep the chicken in the fridge until later that evening when you are ready to cook. Otherwise this recipe is super easy to make. I used tomatoes and peppers in the salad but you can throw in whatever salad or veg you have laying around. 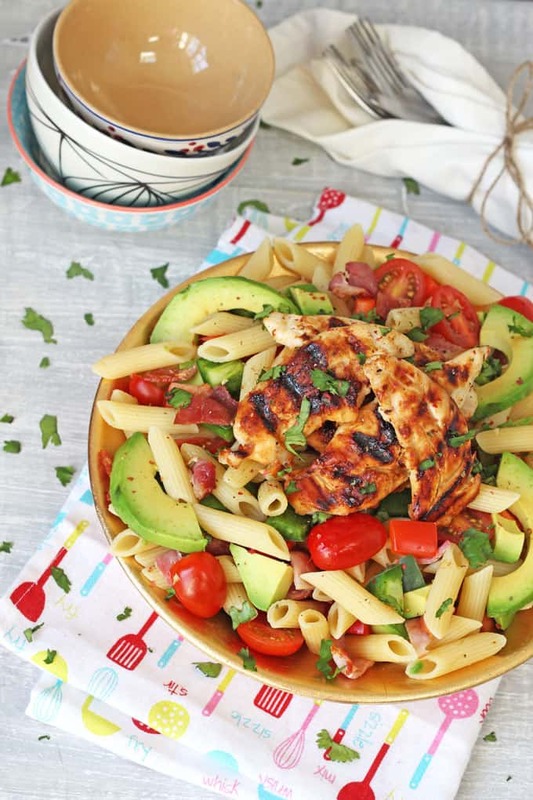 I can see myself making this recipe a lot this summer. I can’t wait to try the chicken out on the bbq. I bet it tastes even better cooked over charcoal! Firstly make the marinade and dressing by combining all the ingredients in a jar or bottle and giving it a good shake. Set half aside to use later as the dressing. Use the remaining half to marinade the mini chicken fillets in a bowl. Cover and refrigerate for at least 30 minutes. Cook the pasta according to the package instructions. When cooked, drain the pasta and run under a cold tap to cool it down. Place the cooled pasta in a bowl. Chop the bacon into bite sized pieces and fry for 4-5 minutes until crispy. Add to the cooked pasta, along with the chopped avocado, tomatoes and pepper. Remove the chicken from the fridge and fry on a griddle or frying pan in a little oil for 3-4 minutes either side or until they are cooked through. 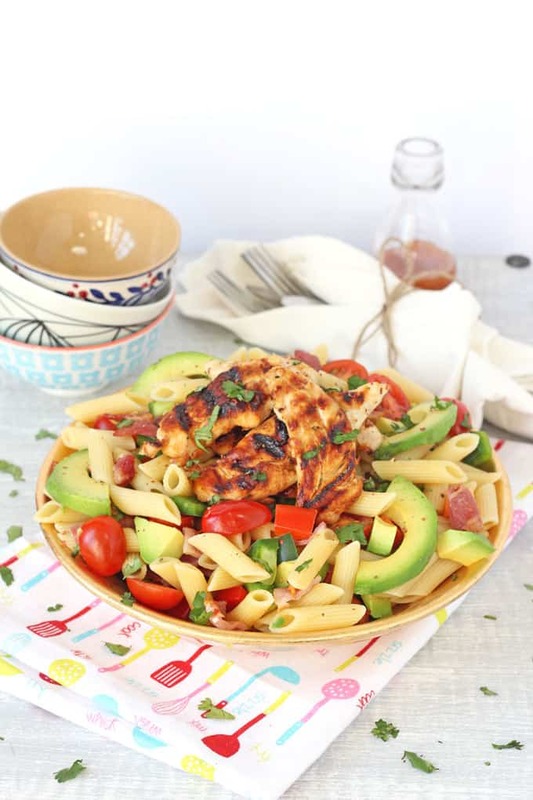 Add the cooked chicken to the top of the pasta salad and serve immediately with the remaining honey mustard dressing either on the side or drizzled on top. I actually made the marinade for this and used it on the chicken and but then served with mediterranean roasted veggies as it’s still a bit cold for salad and it was super tasty. 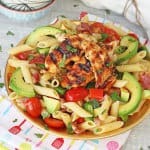 Will definitely try as the pasta salad when the weather eventually warms up!! !